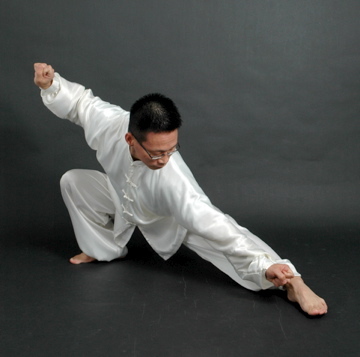 Master Beizheng Liu is a qualified Taichi teacher. She started to learn Shao Lin, Long Fist when she was 6 years old and had high standard instruction from Master Song Zhi Ping – the holder of Hua Fist. Meanwhile she was learning Tai Chi. She continues to receive instruction from the Chinese Wushu Federation systematically. She is a Wushu 5 Duan holder. She has been teaching Taiji in Ireland since 1998. Her school was named as Dr.Beijung Taichi School in 2005. Master Liu is also a qualified medical doctor. She graduated from Beijing University and got her Bachelor degree in 1982. She has been working in the Chinese Medical Centre as a chief doctor since 1998. Since 1998, a few hundred people have got training in this Taichi school. Through many years hard work, they have improved significantly, raising the standard of whole school. In 2004, five of the students got second Duan in Belfast grading – which is the first time ever the Chinese Wushu Association holding grading workshop outside China. The class usually takes place in the evenings of weekdays, occasionally in day time, at 47 Upper Georges Street, Dun Laoghaire, the Chinese Medical Centre. Every session is 1.5 hours. Sunday is a practice for all level students, at Sallynogin Old Folks Social Centre. A second duan student Aoibhinn O’ Tool holds a beginners class in Sandyford.